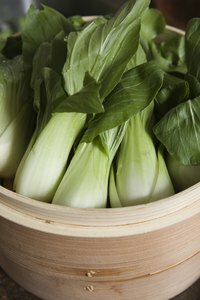 The leafy green tops and crisp white stalks of bok choy, or Chinese cabbage, are a staple vegetable in many stir-fry wok recipes. Stovetop woks usually have flat bottoms so they sit level on a stove burner, while an electric wok features the traditional round bottom that makes it easier to stir the bok choy so it cooks more evenly. Using the right method to ensure both stalks and leaves cook perfectly is the same for both types of woks. Rinse the bok choy leaves under cool water. Pat the leaves completely dry. Trim off the tough ends of the stalks and dispose of them. Cut off the leafy green tops and chop the stalks into 1/2-inch pieces. Use the leaves whole or tear them into bite-size pieces, as desired. Heat the wok over high heat until a droplet of water flicked into it evaporates within 2 seconds. Add just enough oil to coat the bottom and sides of the wok. Place the chopped bok choy stalks in the wok. Stir constantly, using a tumbling motion by pulling the ingredients up the sides of the wok with the spatula, then allowing them to tumble back down, so all pieces of the bok choy cook evenly. Cook the stalks for about 5 minutes, or just until they begin to become tender. Add the leaves to the wok and stir them into the stalks. Continue to stir, using the tumbling motion, for an additional 2 or 3 minutes, or just until the leaves begin to wilt and develop a bright green color. Season to taste and serve warm. Placing the lid on the wok for the last minute of cooking steams the bok choy, which results in an exceptionally tender but limp vegetable. If you use a stir-fry sauce, pour it down the side of the wok in the last minute or two of cooking. Stir it into the bok choy so all pieces are evenly coated.